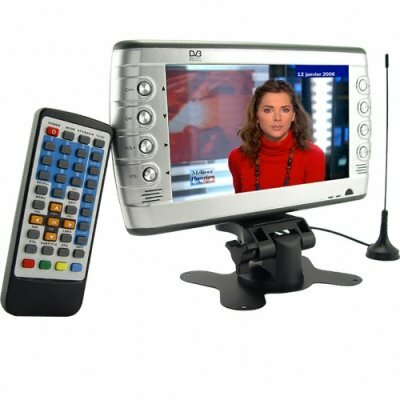 Successfully Added DVB-T LCD Television - 7 Inch Portable TV and Monitor to your Shopping Cart. LCD television with DVB-T receiver for enjoyment of both analog and digital TV. Beautiful 7 inch TFT LCD display with built in front side stereo speakers for receiving and viewing digital TV, analog TV, and digital radio signals. This small profile style TV is an ideal addition to any workspace, bedroom or recreation vehicle. Can also be used as an AV IN monitor for viewing input from DVD players, MP4 players, or other AV devices. Provided with a full function remote control as well as on display control buttons for ease of use. Brought to you by Chinavasion at the usual low wholesale price. Feature it on your internet store today and we can express ship it directly to your customers door. Portable 7 inch LCD television with DVB-T digital TV receiver. Receives both digital TV and digital radio (as well as analog TV). Built-in stereo speakers and fully functional controls on the TV.